It does seem strangely unfair that this decent, if historically inaccurate, war film should be so obscure. Representing (here using the pseudonym Calvin Jackson Padget) one of director Giorgio Ferroni’s (Mill of the Stone Women) final efforts – a filmmaker, whose résumé spanned nearly forty years, and features about as many films to his credit! With a cast headed by the Austrian born Frederick Stafford, best known for his suave starring role as Andre Devereaux in Alfred Hitchcock’s Topaz, Ferroni’s film was stuffed with oodles of post war stock footage. This explosive actioner was also re-edited to form part of Bitto “Al” Albertini’s ultra bizarre War Devils (aka I diavoli della Guerra), another WWII picture that made a stand-alone appearance on Mike Lee’s ubiquitous VIPCO [Video Instant Picture Company] label sometime in 1982. Ferroni’s Battle of El Alamein first appeared on Maurice and Peter Abbey’s Home Video Merchandisers label, a division of parent company Home Video Holdings which was set up by the pair in June 1981. It was this over-sized cardboard box that remains something of a collectors’ choice, although some years later Quick Video, an obscure video distribution label that shared ties with both the Screen in Doors and MPV labels, offered the film with a terrific fiery orange sleeve design that harks back to the colourful days of action-filled comic books, featuring fiercely glamorous characters, as illustrated by figurative illustrator Geoff Holt. 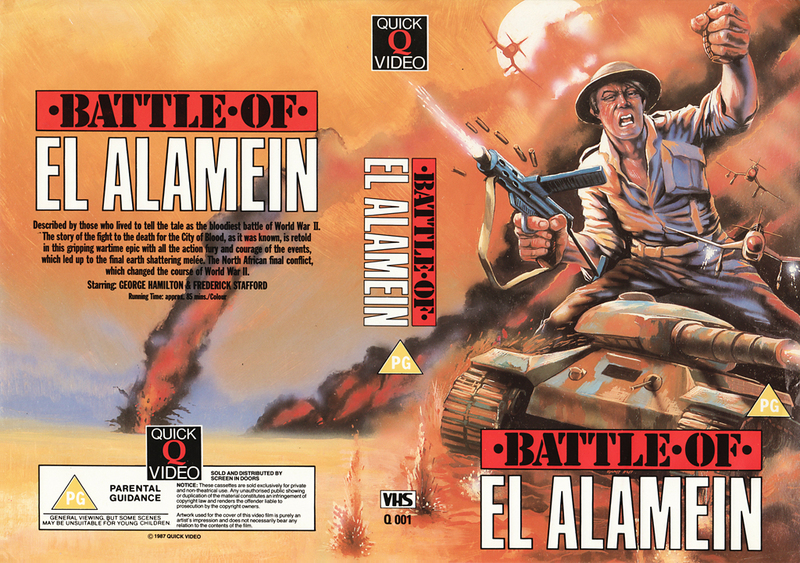 As recently as February 2002, Battle of El Alamein – touted as “The Battle of the Century” has appeared on DVD, compliments of Miracle Pictures – coincidentally the same company that issued former “video nasty” Night of the Demon in a bare-bones release. An alternative release can be found here.